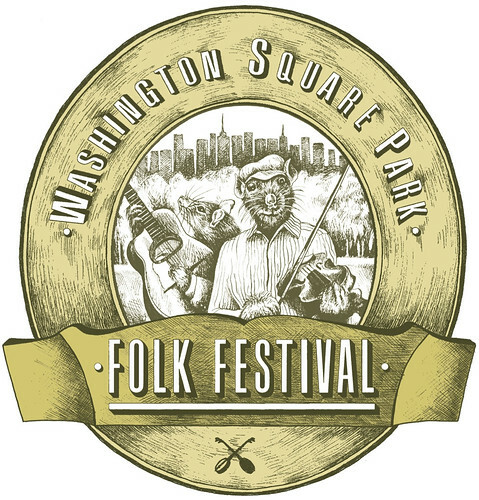 Organizers are happy to announce the upcoming 4th Annual Washington Square Park Folk Festival. This festival is free and open to the public and is set for Sunday Sept. 14th, from 1-5pm. The festival stage is located by the Garibaldi statue on the East side of Washington Square Park, seating will be provided. This year the festival will feature blues music from Jerron “Blindboy” Paxton, two old time string bands; the Down Hill Strugglers, recently featured on the soundtrack to the Coen Brothers’ “Inside Llewyn Davis,” and Lightning in the East, featuring banjoist Steve Arkin, and Radio Jarocho playing Son Jarocho style music from the Veracruz region of Mexico. The festival will close with a community square dance! The dance is always great fun, and will be called by David Harvey of NYC Barn Dance. 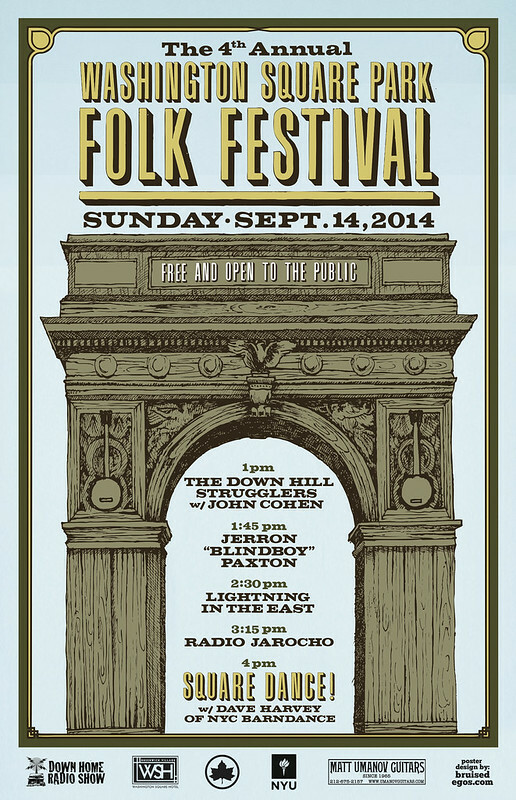 The festival celebrates and continues the long tradition of folk music performance in Washington Square Park. This tradition goes all the way back to the 1940’s and the birth of Folk music in New York City, with the likes of Woody Guthrie and Pete Seeger coming together on Sunday afternoons to play music and socialize in the park. This tradition continued up through the 1960’s where the park welcomed a young Bob Dylan to the folk music scene in the city, and it continues up until today. The Washington Square Park Folk Festival is the first formal festival presentation of Folk music in Washington Square Park’s history and we are proud to see the festival enter its 4th successful year. 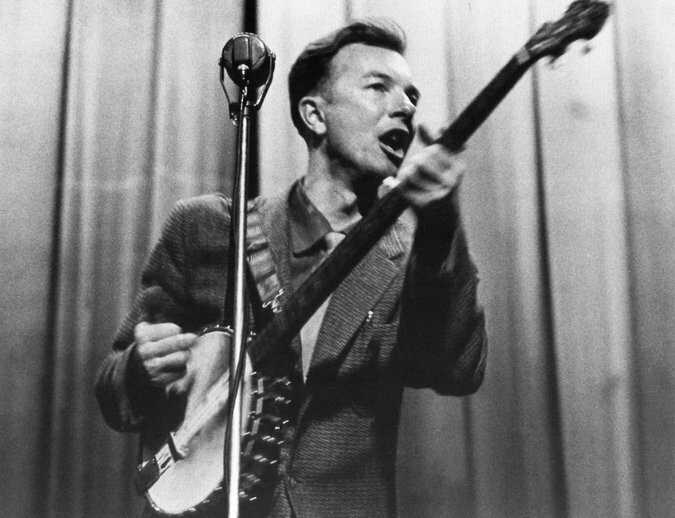 Today we honor Pete Seeger, the first and greatest of modern folk musicians. Pete did it all. What great talent and vision. We won’t see his like again. Included here are a few film clips of him over the years that I think are really good. Click Here to hear an interview I did with Pete in 2007 for Down Home Radio. Pete Seeger invented being an urban folk singer in its modern incarnation. All the strands that we see around us today he in a lot of ways did first, the traditional, the popular and progressive sounds, the political. Pete was among the very first (maybe first?) 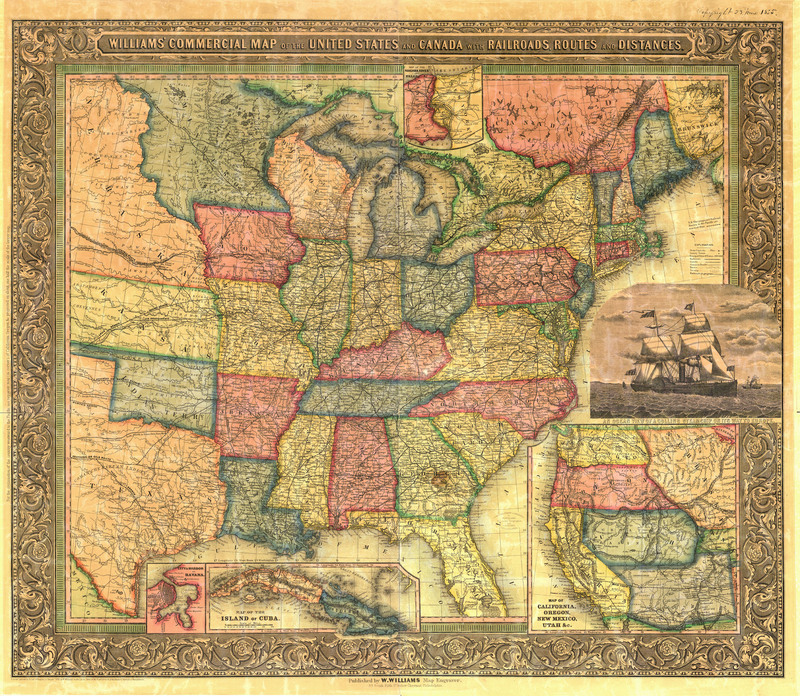 people in the modern era from outside the tradition to learn thoroughly very traditional banjo playing and ballads from records, field recordings and firsthand sources in the South, and although initially an outsider ultimately give back to the tradition. He also played popular and classical music on the banjo and was very well versed in African-American music and 12-string guitar playing learned directly from Leadbelly among other sources. He built on his experience of Woody Guthrie’s songs and style to make his own protest songs in an early modern singer-songwriter style which he invented and which also paved the way for later “Folk-Rock” stylings. And as he broke through into the mass media with his band The Weavers and as a solo performer, Pete really invented the genre of “Folk Music” as a category within the field of Popular Music as a whole. In fact, Pete’s father Charles Seeger, a founder of the field of Ethnomusicology, wrote on the subject, saying that in the modern era, folk and popular music would meld as isolated, local and traditional communities were brought under the influence of mass communication and rapid transit. In the many pieces now being written in the press about Pete I often see it said that he “was a champion of justice, civil rights and the environment.” That is very true, in addition to and in conjunction with music he was a committed and extraordinary social activist. He was also a life long socialist, and someone who had a deep sense of compassion, fairness and respect for all people and communities. His activities in the Civil Rights Movement, Peace Movement and Environmental Movement I have seen widely discussed. But a major part of Pete Seeger’s legacy and the foundation of his identity as a musician and cultural worker, is his crucial involvement in and commitment to folk music. Somehow this aspect of his life, which was of a piece with his other convictions, seems to be poorly understood in the mass media and is somehow always mentioned only in passing. Pete Seeger CARED about folk music – music with a long history, made and perpetuated by regular rural people, played in a rough style and dealing with topics and gritty realities that pop music would never touch. First off, Pete Seeger invented the concept of “pop-folk,” with his band the Weavers, teaming up on their early records with producer Gordon Jenkins (who also worked with Frank Sinatra, etc… for Decca Records) to create a hybrid music of songs from the folk repertoire in a pop style that was usable by the mass culture industry of the time and became extremely popular. And secondly he pioneered the idea of mass group singing at concert events. Pete literally sang together with millions of people over the course of his career. Urbanized or suburbanized people were and are used to experiencing music passively as commercial consumers of CDs, radio, etc. Pete’s mass group singing at his concerts gave people who had lost a personal connection to making and experiencing music, a way to connect, feel good about their musical selves and be a part of a community. He gave back to so many people, at least on a basic level, the chance to sing and make music together, a vital part of being human, even as “progress” has worked to alienate and isolate us. Most were content to sing with Pete at the concerts but many many people also went home and picked up instruments and pursued making music themselves more proactively at different levels. What a talent. That was what allowed him to breakthrough and operate in the visionary way that he did. Pete Seeger had so much talent it was stunning. He was completely unlike any other figure or “entertainer” in the field of American popular music. He was and is the only person in the popular consciousness who cared about folk music, really knew what he was talking about in a very serious way and took that understanding to the stage in his performances. He played at colleges, summer camps, big venues, benefit concerts, radio and television, everywhere. Pete Seeger was also a founder of the Newport Folk Festival that presented so many great traditional artists and is also inextricably linked to the first and greatest independent record company devoted to American Folk Music, Moe Asch’s Folkways Records. Without Pete, who knows if Folkways could have survived all these years? He recorded dozens and dozens of albums for them, which remain among their biggest sellers, and have given them so much needed revenue over the years when most of their amazing recordings did not. Pete was an intellectual and a theorist, as was his father, and was very widely read. He also made films, field recordings and started the magazines People’s Songs and then its successor Sing Out! where he wrote columns, published songs and engaged in dialogue and journalism for years. He produced and hosted the amazing television program “Rainbow Quest” and has also written several books, song books and banjo and guitar instructional manuals. Pete Seeger is much more than a protest singer, although he was certainly that and in great form. He was incredibly proactive and prolific. When did he sleep? In the few times that I got to meet and spend some time with him I found him totally unassuming, uninterested in stardom in anyway, without ego and yet extremely charming and compelling. He was indeed very tall and slim, he had small eyes, a ready crooked smile, he drank buttermilk and even at an advanced age seemed youthful in a way. You realized immediately upon talking with him that he was extremely smart, focused but also a serious dreamer, whose ideas many felt were impractical! But a lot of them caught on in big ways… I think its possible to say that without Pete those of us working in the field of folk music today might not be here at all. If folk music means something to you, then Pete Seeger lives on. 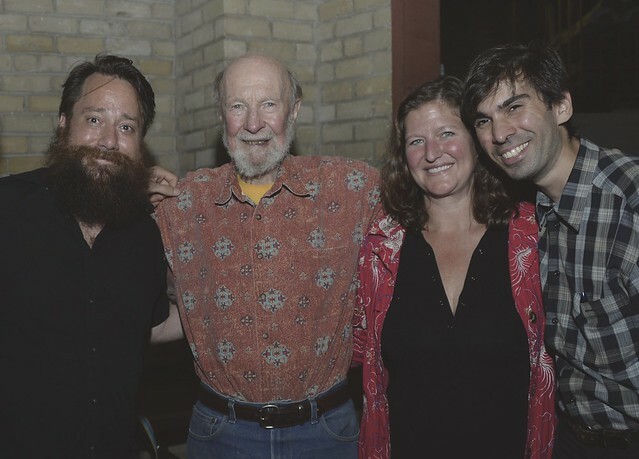 Here is a photo of Pete Seeger with Geoff and Lynette Wiley, owners of the Jalopy Theatre, New York’s best folk music venue, and myself at a Woody Guthrie tribute event at Brooklyn College in 2012. Here is an excellent interview with Pete Seeger on the news program Democracy Now! 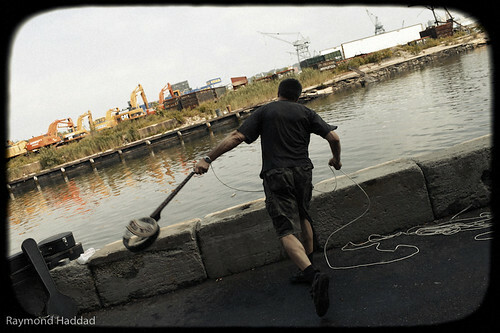 We hope that you enjoyed last year’s, 5th Annual Brooklyn Folk Festival. Many of you have been friends of the Festival from the beginning, and we truly appreciate your support. We hope you have enjoyed watching the festival grow from a small event, into a substantial yearly showcase, drawing bands from New York City and across the nation. 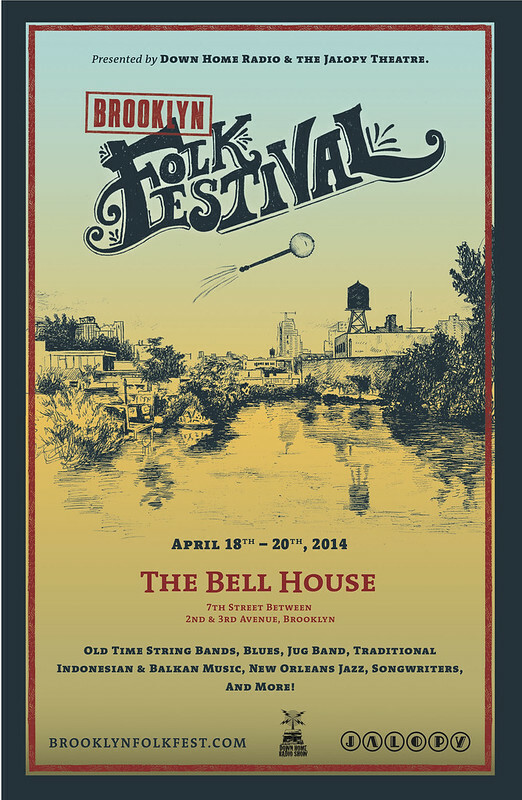 This year’s Brooklyn Folk Festival will be held at the Bell House, which was also our home for last year’s Festival. The 6th Annual Festival is scheduled for April 18th-20th, 2014 and will feature 30 bands over three days, playing American and world folk music, along with workshops, film screenings, jam sessions and the world-famous Banjo Toss Contest. 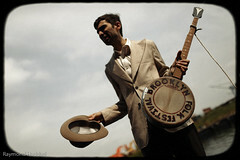 Tickets will be available soon, stay tuned to www.jalopy.biz or www.brooklynfolkfest.com for more information. We look forward to seeing you there. The Festival has been and wishes to remain the nation’s largest folk festival set in an urban area; right here in the heart of New York City. 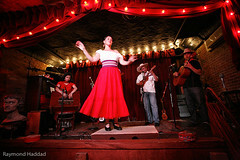 The festival is curated by folklorist, musician and author Eli Smith in partnership with the Jalopy Theatre and exhibits the very best underground and nationally recognized talent in the field of Folk Music, including blues, bluegrass, old time, songwriters, jug bands, gospel music, klezmer, Mexican, Balkan, African and Indonesian folk music and more. In the 1960’s the greatest yearly gathering for folk music took place at the Newport Folk Festival on a farm in Rhode Island. Today we want to keep the yearly focus of the vibrant new folk music revival squarely here within the borders of Brooklyn. This will keep the festival accessible for New Yorkers and visitors from out of town, and help keep Brooklyn the heart of the contemporary revival of interest in folk music. We are starting early in order to find a home for the 7th Annual Brooklyn Folk Festival, to be held in 2015. We will need your help to secure a larger location for the festival as it continues to grow in size and scope. The festival has already been recognized by sold out crowds, the press, and folk music artists themselves as a “magical event” which stands out with clarity and vision against a backdrop of noise. In addition to finding a location, we wish to invite and confirm notable acts and artists to join the festival. For all of these reasons we are asking you to support the Brooklyn Folk Festival. We are asking for your donation to help us plan and secure Brooklyn Folk Festival 2015! The Festival is a non-profit event, and your donation is tax deductible. Donations can be made out to our fiscal agent, Fractured Atlas with our account # 11-3451703. Checks can be sent to 315 Columbia Street, Brooklyn NY 11231. You can also follow the link at the bottom and make your secure tax deductible donation online. Folk Hero – $1000: 3 three-day passes to the 2014 festival, 10 tickets to any shows at Jalopy Theatre and a complete line of Jalopy LPs and CDs. Eli Smith, Lynette and Geoff Wiley and the Friends of the Brooklyn Folk Festival.s, I support The Brooklyn Folk Festi! I’m pleased to announce that my old time string band the Down Hill Strugglers has a song on the soundtrack album to the new film by the Coen Brothers, “Inside Llewyn Davis.” Its track #8 on the soundtrack album, a great old folk song called “The Roving Gambler” that we first recorded a couple of years ago for our Folkways record. We are joined on this song by our great friend, mentor and ofttimes bandmate John Cohen (of the New Lost City Ramblers). The film is really good. It’s set in the Greenwich Village folk music scene in 1961 and is loosely based on parts of the autobiography of the great folk and blues singer Dave van Ronk. Its great to see the Coen Brothers do another folk music based movie as a kind of followup to “Oh Brother Where Art Thou?” although the films are very different. The soundtrack album is set for release on Nov. 11th and the film itself comes out in mid December. 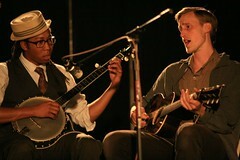 Other musicians on the album include the amazing and versatile Punch Brothers, Marcus Mumford (without his Sons) and noted folk singer Justin Timberlake. The album was recorded and produced by T Bone Burnett. More information is available at the Nonesuch Records website, and you can hear the whole album at NPR’s website. 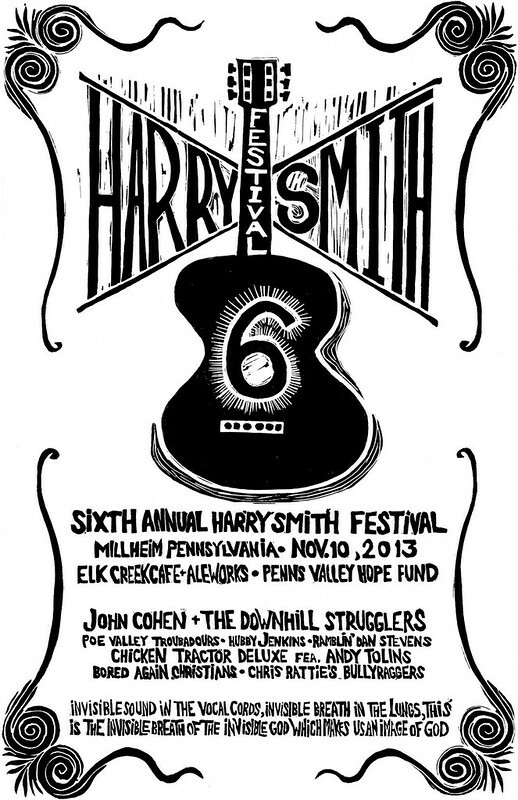 Look out for the 6th annual Harry Smith Festival, coming up this weekend in Milheim, PA! Should be a great event, I’ll be there with the Down Hill Strugglers and John Cohen… For more information take a look at their facebook page. They serve food, but BYOB/Wine. 7pm opener – Flatville Ditch, we go on at 7:45pm. 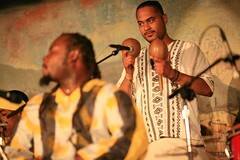 See: www.folkandrootsfestival.com for tickets. Ralph Stanley headlines. Creative Alliance – us with John Cohen (of the New Lost City Ramblers). $20, $15 mbrs & stus. Maryland State Arts Council’s Cliff Murphy hosts a Q & A. My friend Peter K. Siegel and I have just released an album of Union and Labor songs that we’ve been laboring over for some time. It came out great! It features a number of old standards of the American labor movement, as well as several that are not well known but are really good and interesting songs. Many of the songs were penned by old IWW (Wobbly) song writers, including several by Joe Hill. 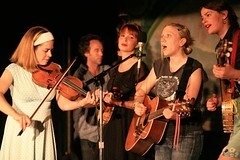 The songs are rendered in an old time string band sound. The album features Peter and myself, joined on a number of songs by Andy Statman, Craig Judelman and Walker Shepard. The album also features really nice liner notes – a 20 page booklet with an essay written by Cliff Conner, lots of pictures, etc. We really tried to make a high quality album that sounds great and is accessible to people, so that these great old labor songs might live again. If you are interested the album is available in all the usual ways – Amazon, iTunes, CDBaby, stealing, etc…. We hope you will enjoy! Hello everybody. 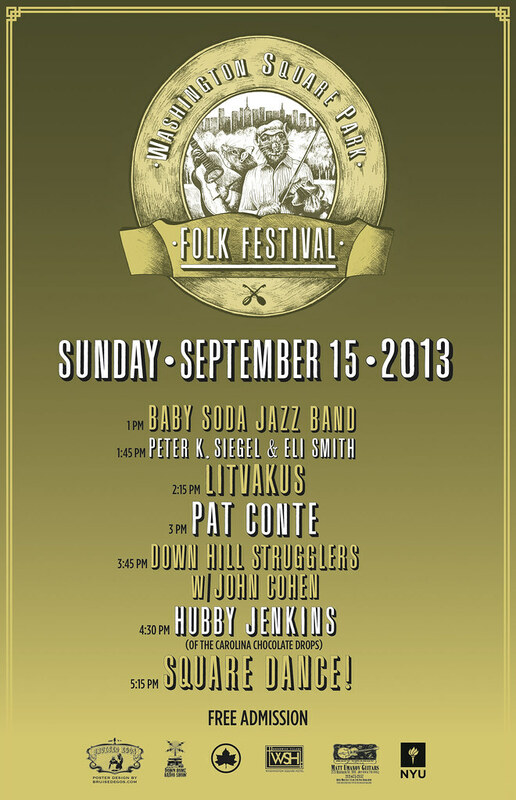 Well the 2013 Washington Square Park Folk Festival is coming right up and its gonna be great! Come out to the stage on the East side of the park on Sunday, Sept. 15th from 1-6pm. Free admission! Thank you so much to our sponsors for making this event possible: The Washington Square Hotel, Matt Umanov Guitars, NYU, the Jalopy Theatre and the NYC Parks Department! Have you read the Old Time Herald lately? Just wanted to write and offer a plug the for the Old Time Herald Magazine and for their series of Unknown Musician Postcards. They’re really cool, and affordable! Great for putting on the wall or sending through the mail… Order yours and subscribe to the magazine today!